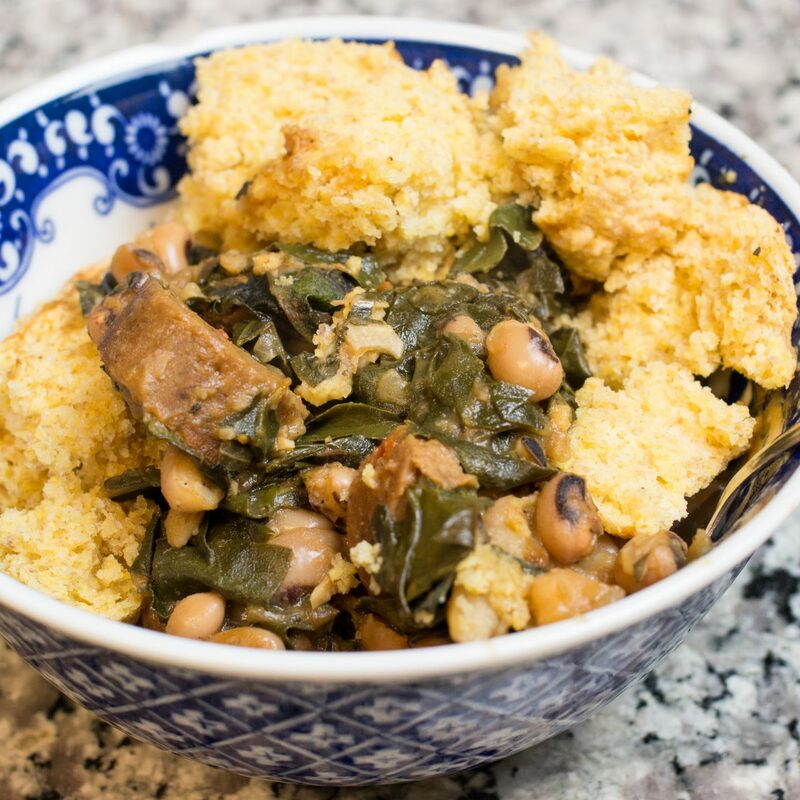 I haven’t looked at the legislation to confirm this, but I’m pretty sure it’s compulsory to eat black-eyed peas with collard greens and cornbread on New Year’s Day. 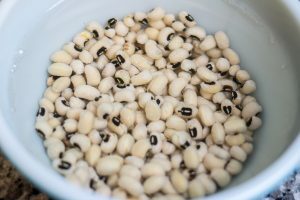 While I was watching WRAL last week, they had a segment with a recipe for a black-eyed peas, collards, and cornbread casserole that looked interesting. Thank goodness I remembered the gist of the recipe because I had a heck of a time finding it the website! I tossed onions into a hot skillet. Once those started getting soft I added garlic and some vegan sausage. I let that cook for a minute or two, added the black-eyed peas (which I had pre-cooked in the Instant Pot) and started adding in the collard greens one handful at a time. As the greens cooked down a bit, I added a cup and a half of vegetable broth. I brought that up to a boil and then let it simmer for about 10 minutes. I added some salt and pepper and a couple of other things that I pulled off of my rack of Penzey’s spices. 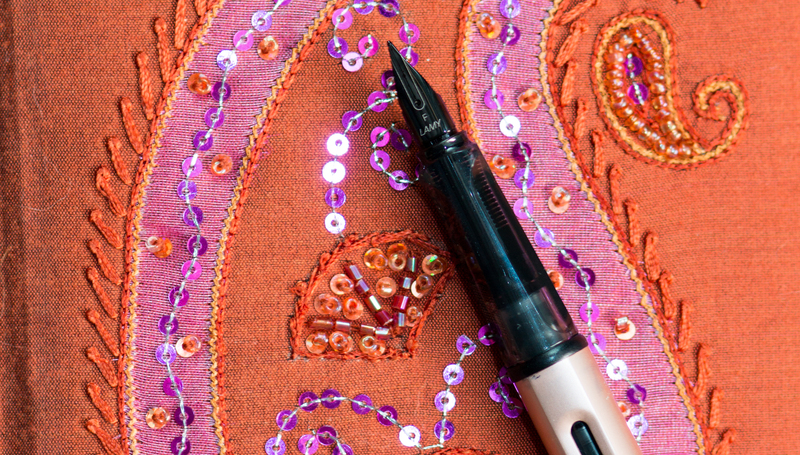 Really, this is a great blank flavor canvas that you can experiment on. You can add some crushed red pepper for heat, or celery/celery salt for a different profile. Really, you can do almost anything here! While the stuff in the skillet simmered, I mixed up some cornbread mix and preheated the oven to 400 degrees. 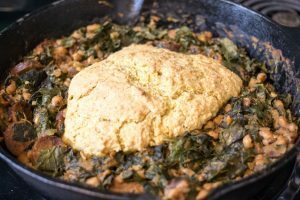 Black-eyed peas, collards, and cornbread, all in one skillet! When the oven was hot enough, I poured the cornbread mix into the middle of the peas/collards/sausage mixture and baked it for about 20 minutes. The final product was DEEEEEELICIOUS! It was hard to not devour the whole pan (if there hadn’t been cornbread in there to slow my roll, I just might have)! This is actually something I’ll make throughout the winter as it’s filling and tasty. And also I need all the wealth and prosperity karma I can cook up.